Finding Colleen’s web site really was an eye-opener for me as I did feel overwhelmed by stuff at the time but didn’t really know where to start. I just moved in with my boyfriend and we both had lived in shared flats before, so we had a mixed jumble of furniture and household goods and got help and cast-offs from many relatives as well. So I was in that new apartment surrounded by lots of stuff that didn’t really match and didn’t really fit either. Moreover as he liked his stuff and I liked mine, of course we didn’t want to give away our own stuff but would have preferred the other’s to be sold, donated or trashed. You know how it’s always easier to point out other people’s trash, as you have no sentimental feelings about it and it might also not suit your taste as well as things chosen by you. As there was not much money to spend on this project and we both have a “no-waste”-mentality, so trashing wouldn’t have come easy anyway, I was so glad to find Colleen’s website and her slow-and-steady approach. From the first day, I stuck to it and it really wasn’t hard to find one thing a day to give away or recycle. I also tried to implement the “one place for everything”- strategy soon, which meant that we joined all our office supplies, tools etc. and started using them up instead of bringing new things in due to not knowing that we already owned something like that. However over the time, mostly happily hauling small or big bags of stuff to the thrift store every other week, I hit frustration a couple of times. Even after months our apartment wasn’t near to a minimalistic state, we still own quite a lot which isn’t really necessary, just because we or one of us doesn’t want to let it go. We didn’t drastically reduce our space or furniture and it still seems to be rather well filled. So I asked myself more than once: What did I do all this time? Is there progress at all? Last september I took a few photos of parts of our apartment, namely shelving units etc. Oh yes, it is still full, but note that all that left this bookcase, left for good, while many other things that cluttered other parts of the apartment have found their way in: This suitcase (which holds our yarn stash and knitting needles) had no home before – it was somewhere underneath the sofa or somewhere else on the floor. Same goes for the basket which is now next to my sewing machine – it holds sewing/mending work in progress and was underneath the sofa as well. Also, our bookcase now holds the wrapping paper, my clarinet and three unused canvases that had no real home either. Mostly books and CDs have been decluttered, but also a few other things, like two vases that went to the thrift store, the little black laquer tray I gave to a friend or the pin cushion which now fits in my sewing kit. So, yes, although we still have a full bookcase, although there are still many purely sentimental items in it, I can spot a difference in the before and after photos and I know that this means one less moving box for books, which shows to me that I am, after all, making progress, as slow as it may be. Since Sanna first sent me this post she has decluttered even more. Proof that, over time, one is prepared to relinquish more and more items that once they thought they never would. A job well done I’d say. 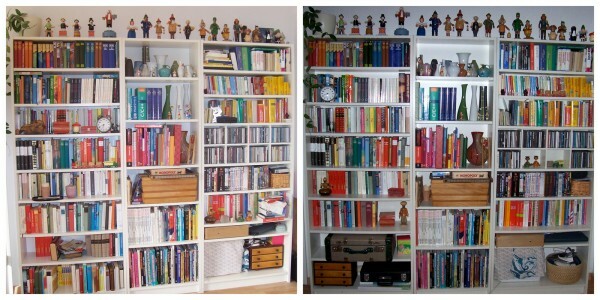 Below is a very current photo of the decluttered shelves and below that a collage of the Before After and Now shots just so you can compare the difference. As Sanna said when she sent me the new photo this week…. Last but not least I am once again going to harp on about those tchotchkes collecting dust around the home. They have to be cleaned, they have to be housed and they take up valuable space that could be used for something useful. I am not saying get rid of them all, I certainly won’t be. Just do yourself a favour and lighten your space and your work load. Declutter a few more this week. Well done, Sanna. You have given the remaining items room to shine. The photos really show that. Isn’t there a ‘rule’ of composition in art, about the amount of ‘white space’ in comparison to the rest of a picture? I think that is what is happening with your shelves. This is a way of thinking about my home that I did not understand until I was actually typing my comment on your post! Thank you for being the catalyst for that. That’s an interesting point about the white space. It is true that it feels more harmonic and also calmer. I still think that the shelving unit could do with less stuff in it, but I learnt that I needn’t force a big purge, as steady decluttering will bring me there eventually as well (and is much less stressful for me). I agree entirely. Even though there are still a lot of wonderful, fun and colourful loved items on those shelves, they now look uncluttered and able to shine out. It has got me thinking about an idea for a post next week. Thank Jo H for the inspiration. And to you Sanna, I think it now looks like you have a collection of individual items you really enjoy rather than shelves crammed with items that have just accumulated over time. I’m looking forward to your post, Colleen. After I posted my comment, I started thinking that you may have gone over this concept already and that’s why I finally figured it out 🙂 I’m interested in what you have to say on it. Thank you very much Colleen. I’m really glad I took those photos. I’ll probably compare in a few months again. It is fun to see how things changed over time. When looking at the before photos I can see many books I liked reading but gave away, because I had no intention to re-read them soon. Although I have some warm feelings about a few items I see in those before pictures, I’m not regretting that I don’t own them any longer. I really didn’t need them in the meanwhile and the uncrammed and lighter shelves are a great reward! Taking pictures really is a great way to motivate yourself, so I’m glad I tried it! I love the middle shelf where you have just the vase and the plate. It really opens it up. You are a good role model for someone like me who has things crammed in all 5 bookcases. Although, I will say that I just stopped a book club that was sending me 6 – can you believe it – 6 books at a time and am giving away every book I read so it doesn’t go back on the shelf. Now, if I would just read MY books instead of checking more out from the library, I’d make better progress. 1. Ban yourself from the library for a month. Only reread books on your shelves or read books on your shelves that you haven’t got around to reading yet. If you feel the desire to go to the library because nothing on your shelves appeals to you then perhaps that is an indication that many of them don’t need to be there and can be decluttered. A month isn’t a long time and you may learn something from it. Give it a shot. 2. When it comes to feeling like you are making no progress I would suggest this, as I have done so many times in the past. Don’t look at the big picture just revel in the joy of every little item you put aside to declutter. That is what I did from the very start of my mission. Every day that I found that thing to declutter I was satisfied I was making progress and I was happy. Maggie, if you keep reading other books than the ones you have on your shelves, maybe have a second look on them and ask yourself whether you really still want to read them. I decluttered about half of my unread books as well, because I found I just never felt like reading them – for years already! Getting rid of those has probably been one of the most liberating experiences during the decluttering process. Still, I think that quitting that book club is the most important step. Good for you! When you stop adding, you can take all the time you want for decluttering and still reach your goal. The pictures show a progress of about 8 months – that is a lot of time for a few books. But then, you can see very well that it is becoming less continuously, so I don’t mind that it takes me so long. I feel confident that I am going to reach my goal – and am not sticking in some kind of yo-yo effect. Sanna, I didn’t read you response to Maggie until I has written my own. It seems we both had the same idea. Good job Sanna. I like the last picture. It shows some space around the items so things aren’t quite so crowded. That means you can add a book or tow without forcing things. I’m working on having some more space on ours. 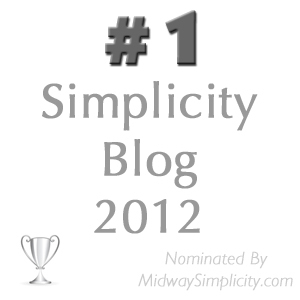 Thank you, Deb J, and good luck with decluttering your bookshelf! Michelle, good luck with your yard sale! You will feel so relieved when those boxes are gone! The worst thing about clutter really is that so soon it all becomes a jumble and you can’t see at once anymore where your important things are. Great job, Sanna! Looks terrific, now you can see that there is breathing room on it. I have decreased the amount of books I own also over the past year. As soon as I am done with one, out it goes. I still have work to do in that department, but just as you mentioned, it takes time, but you will see the difference that one item a day can make. It just takes patience and making a conscious effort to not add more to our homes without making a sacrifice. I’d say you are on the right track, Jen. Keep it up! Thank you, Andréia! You’re so right about the light feeling – doesn’t that feel great? thanks for sharing. I think it’s a great example that one neither needs to be a minimalist nor to change his/her style and taste to make an impact. Also thanks for pointing out all the things you moved to the bookcase once other stuff in there was decluttered. It is good to remember that things are not static in a home and sometimes decluttering and rearranging go hand in hand. Things have been moved around in this apartment a lot and lately I downsized from three bookcases (60, 60 + 80 cm) to two (60 + 80). Now of course the airy look I had before is gone and though I decluttered a good amount (about 3 full shelves) it was weird at first because now the remaining 60 is full again. It is still a big improvement if you see the overall picture but I really needed time to get that into my head. Just a thought: Do you still use the dictionaries a lot? In the latest bookcase declutter I realized mine were more sentimental (languages were a big part of my education) than practical (I usually go to leo.org nowadays). Wow that is a lot, to reduce your shelvings by so much! Congratulations. I’m sure those shelves will get less crammed over time as well. 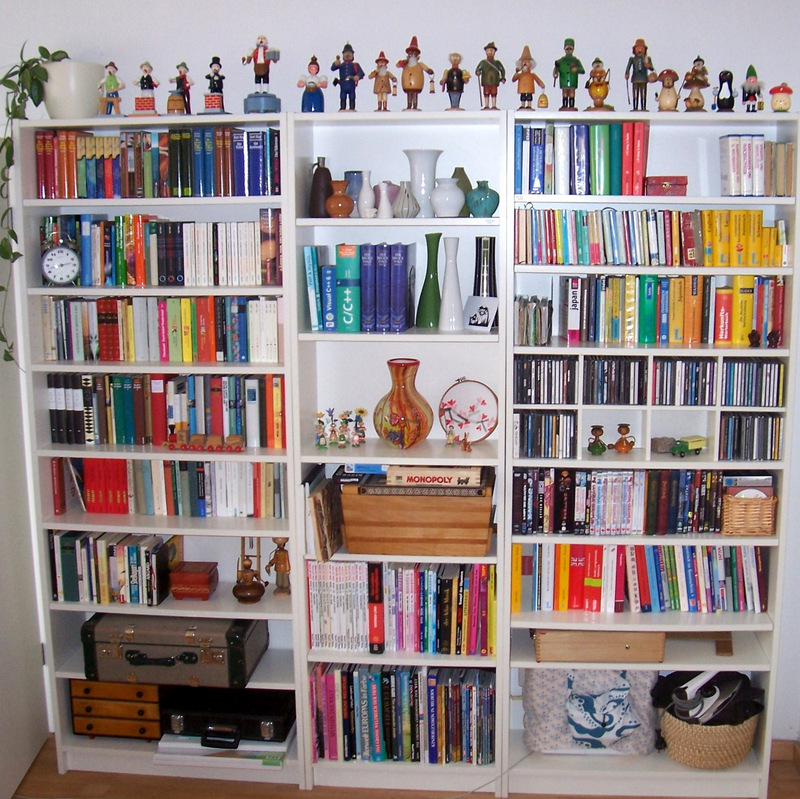 When I first started decluttering, I did have more bookshelves in other rooms as well, which I emptied, so that shelving unit in the living room now is the only place that holds books. We still use all dictionaries and language books for Japanese, which is the biggest part. I also to this day don’t know a good online dictionary for Swedish, so that one is necessary as well. French, Latin, Italian and English wouldn’t be that necessary I guess, but it’s only one book each and sometimes I (or my boyfriend) just want to look something up without opening the computer. So they stay for the moment. I have noticed though that my decluterring efforts focused more on novels and such lately, so I will take a look at the language and other non-fiction books as well again (I did declutter a few single books from that area, but not much). Also, the non-fiction books are something I have to discuss with my boyfriend a lot, because he is hanging onto them as well (while for novels, both of us kind of have their own stack), so naturally decluttering is slower in that area. Good luck with the furniture, Sanna! Great (and many) languages! For me it was only english (online), French (Not much needed These days, sad but true), Latin (already hatet it in school) swedish and Spanish (both pretty much only aspirational). The purging of Books was a journey of several Years so far which I consider finished (at least for now) because I ruthlessly got rid of all fiction except a Small Stack to read. Mmhh, “got rid of all fiction” sounds harder and more radical than it really is. I simply found out I am not big on re-reading. I get excited about new books easily and therefore just don’t need every book I ever enjoyed on hand. I figured that should the urge to re-read something be so big that I remember the book without seeing it I can justify to purchase it again as that might be once every couple of years – or never. I’m not big on referencing either so what I kept are either comics/graphic novels (those get reread from time to time), special literature I got for my thesis (it was hard to get and I am sentimental about it and I still find the topic interesting, so I might actually re-read those at some point) or “instructions” (crafts, sewing, DIY). I also have some non-fiction-books that I plan to read but those as well as the remaining fiction books will get a regular cull should the topics not be interesting to me anymore. It took years but it felt good and natural and my apartment went from a book storage space (they were everywhere!) to a place with only one bookcase (the second bookcase holds CDs … but that is a totally different story). one totally different thing: I lately noticed that my sentimental items that I don’t want to display (at the moment – but some of it probably never) has gone down to one small box. I still have letters and pictures and stuff like that in abundance. But when it comes to “real” things I decluttered more than I ever thought in the sentiments-department and some objects have been put to use also and I decluttered something else that did the same job but that I was less attached to for it. “Just a small stack to read” – that sounds great, Ideealistin! Hi Sanna, I like your figurines. They appear to be a cared-for collection as opposed to a jumbled heap of stuff and it is nice that you have the pieces displayed in a way they can be admired and appreciated. The nice thing about decluttering is that you don’t have to get rid of everything. Now, does your partner do the dusting….? That said, I like them as well, Wendy B, though if they were mine I would part with a few of them and reduce the collection a little. In general though I like those colorful fellows in our living room. Oh wow, that’s amazing progress. The photos are a great way to measure gradual process. Awesome work! Thank you, Mark Adam Douglass! Colleen and Sanna, Your remarks about not going to the library for a month was just what I have planned to do. I have 3 books left to read of the recent journey there and when they are read, I do not plan on going to the library until I have read a number of the books I already have. About 4 months ago, I did just that and read and sent to a friend about a dozen books. I still have tons to read but am also going to sort out the ones I probably will never read and donate them to our local library. I’ll have a neighbor take them to the library so I can stay out of there. And about the mini-missions for this week. I have 2 drawers overflowing with socks. Colleen, I like the idea of taking them all out and seeing how many get worn over the next month. I’m sure I have quite a few that either have “bad heels” or that are never worn so I can donate some to the Goodwill. Good mission. I had planned to work on my sock and undies drawers this weekend since we have a four day holiday. I sure love reading about other people’s progress, too! Great job! We are still working on our bookcases. We had 18 of them in our home. We’ve gotten rid of one (well it needs to be taken to Goodwill which will be done soon) and I’m hoping to get rid of more over time. Most of our cases are the shorter cases, not the very tall ones. It is true that as they empty out it is tempting to shove other ‘homeless’ items into the shelves making it seem like no progress has been made unless you stop and think about it. Melissa, that’s wonderful that you already cleared one of your bookcases! I enjoyed seeing your photos, Sanna–and great job on the decluttering! Good job Sanna. I like the last picture.